Hi, all! “Advance Notice” is a new section where I review the galleys (advance reading copies) I received via Net Galley and other sources. Most of these books are near their public publication date, so consider this a spoiler alert! I usually try to alternate between fiction and nonfiction books when I post what I’m reading, but this time I had to jump into Crimson Shore when I was recently approved to read the galley by Net Galley. And yes, there were other galleys that had earlier publication dates, but I was in a Pendergast kind of mood. I have been a longtime Preston/Child/Pendergast fan since Relic, which introduced the irreverently unorthodox FBI Special Agent Aloysius X.L. Pendergast, of the New Orleans Pendergasts, in 2007. I first picked up Relic at a used book sale for fifty cents, and was hooked. I even read some of the separately written books by both Preston (I recommend The Codex) and Child (Deep Storm was good). Crimson Shore is the fifteenth installment in the Pendergast series. This book has Pendergast taking on what appears to be a routine wine theft on the outskirts of Boston, Massachusetts, except that the wine overlooked by the thieves was of an extremely rare vintage. Pendergast, being a great oenophile, took the case on the condition that he would receive a bottle of the wine as payment (no small gesture, as one bottle was worth at least $10,000). He also saw this as an opportunity to further socialize his ward and quasi-forbidden love interest Constance Greene, in an attempt to re-cage the savagery she exhibited in Blue Labyrinth. Pendergast navigates the abusive power of the local police chief, and utilizes the assistance of the deputy chief–who comes from one of the town’s prominent families–when the wine theft reveals roots in the town’s dark history regarding a local shipwreck in the 1700s. Bizarre deaths lead a gruesome trail to an unexpected ending, which may finally use up the last of Pendergast’s seemingly nine lives. 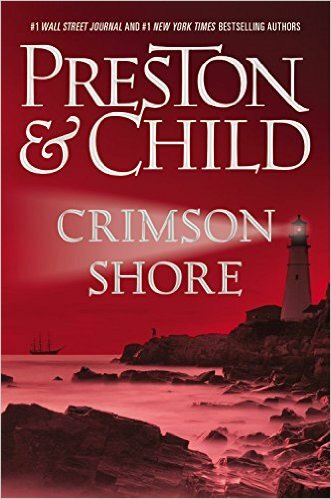 Preston and Child still deliver excitement in Crimson Shore, but I can’t say that I’m that enamored of Constance as a more prominent character. Her role has grown in each book since The Cabinet of Curiousities, but I rather liked her when she was confined to an enclosed space, be it Pendergast’s Riverside Drive home; a cruise ship; or a mental institution (she was actually at her best there). Constance on the loose in society, and struggling to acclimate herself to modern public ways, was an incongruous note in an otherwise harmonious book. I’m also on the fence about Pendergast’s obvious feet of clay since Fever Dream; while humanizing his character (Pendergast driving a Porsche? Really? ), the razor-sharp investigative skills and abrasive, yet genteel Southern charm that put him on the public map seem to be eroding since that book; this becomes more evident in Crimson Shore. Still, Pendergast fans will enjoy his latest adventure, and the cliffhanger, while surprising, will not cause too much worry among the Pendergast fan club. There is also a recipe of sorts for preparing Sole a la Pendergast, a fillet of fish with a wine-based, creamy mushroom sauce. Crimson Shore is available for pre-order at a discount; the book will be released on November 10, 2015, at full price.